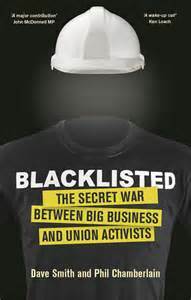 Brian Higgins, a much blacklisted building worker and Secretary of the rank and file Building Workers Group, reviews Blacklisted, The Secret War between Big Business and Union Activists, by David Smith and Phil Chamberlain. This much needed book is a powerful and always compelling expose. It is sometimes moving with first hand accounts by the victims of the extremely sinister blacklisting conspiracy conducted by multi national building employers and others against organised labour in the construction industry. HOW MUCH DID THE UNIONS KNOW? More than they’re letting on that’s a cert! We should expect fulltime union officials to represent our interests at all times but the reality is often very different as we know, often to our cost. We also know there is a reluctance to criticise, never mind condemn, full-time officials because this reflects badly on unions which many workers regard as their organisations. However to their great credit the authors know that to get to the roots of the matter they have to leave no stone unturned even if this means some fulltime officials crawl out from under one of these stones in this process. The book says I raged against the blacklist. I did and still do. But I have to say the thing about it which angers, in fact, enrages me most, is that some fulltime officials undoubtedly aided and abetted blacklisting of rank and file union members and some are probably still doing this as the Blacklist continues. It is painfully obvious building employers – who regularly wined and dined fulltime union officials, took some on golf outings and to sporting contests, to very expensive posh hotels, and even on visits to the Naval and Military Gentlemen’s Club – would demand some things in return! After all there is no such thing as a free lunch and we’re talking about this with knobs on here! Don’t tell us that sometimes the names of site union militants and activists did not come up, and what fulltime officials said, in these circumstances, did not end up on some Consulting Association (CA) files. This sort of socialising, fraternising and consorting with building employers masquerading as ‘negotiations’ is corrupt and corrupting in the extreme. It’s absolutely disgusting to think that while fulltime union officials were doing this many rank and file union members were being blacklisted out of existence! This euphemism for corruptly accepting ‘hospitality’ paid for by building employers was coined by George Brumwell when he was the General Secretary of the Union of Construction, Allied Trades and Technicians (UCATT). So it went right to the top! SECURITY SERVICES ASSIST IN BLACKLISTING. The book also exposes how the state assisted blacklisting, particularly the Metropolitan Police’s Special Demonstration Squad (SDS). They infiltrated some unions and what they learned from spying on members of construction unions ended up on some union members’ CA files. In the speech, in 2013, by Michael Meacher MP to the Blacklist Support Group (BSG) on how the victims of blacklisting had been betrayed by the state, courts, the ICO, all political parties and the police and media he could have added – and your trade unions! They had joke internal inquiries into full-time officials, who were of accused of assisting the blacklisting of some union members. The unions and their lawyers also performed abyssmally in Industrial Tribunal cases over the CA and blacklisting. Before finishing I have to say the heroic struggle of the Unite Rank & File Construction sparks deserves a special mention. They have been the driving force behind the BSG and all the advances made against the Blacklist on sites like Crossrail. But the sparks can not do it on their own. It will take one big Rank and File United Front organisation composed of all occupations in construction to put a stop to the Blacklist once and for all. I must also say this tremendous blacklisting buster of a book by Dave Smith and Phil Chamberlain has given us blacklisted workers, and all of our many supporters, a public voice and a weapon with which to fight and continue the struggle for justice and to put a stop to blacklisting once and for all. Buy it! Read it! Sell it! Spread the word and let’s get this voice, this book to site workers everywhere we can.